Carotid dissection is a tear in the wall of the artery. Please see comprehensive guide to what a dissection is and the various ways it plays out here. Dissection only rarely causes pulsatile tinnitus. When it does, the reasons are two. The most common scenario is dissection resulting in significant narrowing (stenosis) of the dissected vessel. This stenosis leads to turbulent flow. Because the most common location of carotid dissection is just underneath the skull base, in the upper cervical segment, the resultant turbulence is in the viscinity of temporal bone and ear apparatus. Occasionally, the ear will hear this kind of turbulent, pulsatile flow. The bad thing is that dissections can cause strokes and other issues. The good thing is that this usually happens in the first few hours or days after a dissection. By the time most outpatients with dissections come to office, the sound (and hence the dissection) have been present for weeks or months. The risk of stroke in this setting is extremely low. Also, dissections usually heal on their own (spontaneously) So does the sound. Most patients with dissection report that the sound improves a lot. Sometimes, the sound, usually in a much quieter form, can persist indefinitely after a dissection heals. Treatment is usually conservative (observation, aspirin, etc). Intervention such as stenting is very rarely required for dissection. 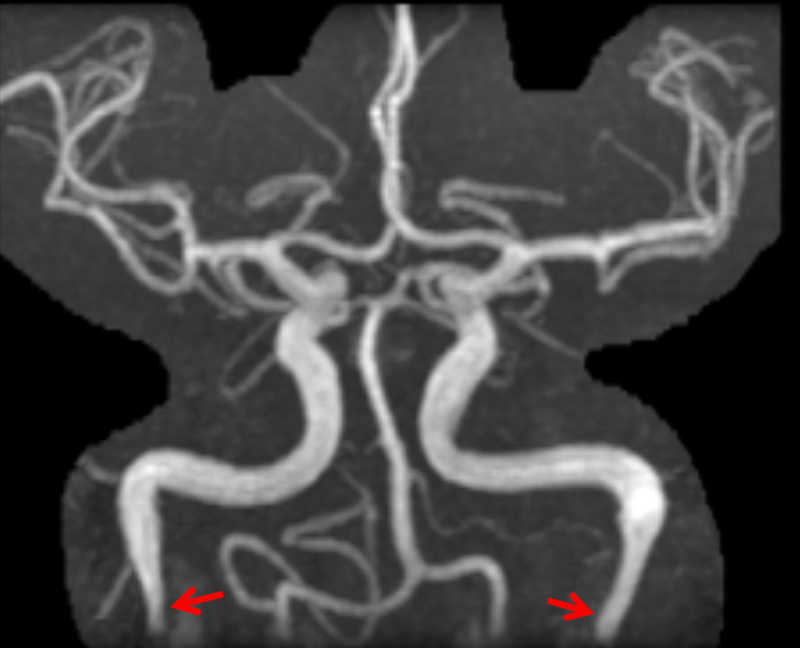 Occasionally, stenting can be done to eliminate dissection-related pulsatile tinnitus. It should be understood that this treatment comes with a small but real risk of stroke and is not recommended unless there is a very good reason to do so, on individual basis. Dissections frequently result in neck pain on the side of dissection. The reverse is not true — most neck pain is not from dissection of course. Dissection can also cause “Horner’s Syndrome” — a smaller pupil of the eye, a droopy eye, and sometimes lack of sweating on the side of dissection. These unusual findings, when present, especially in combination with neck pain and pulsatile tinnitus, are concerning for dissection. Here is a typical patient history with dissection — neck pain, pulsatile tinnitus, and Horner’s syndrome. 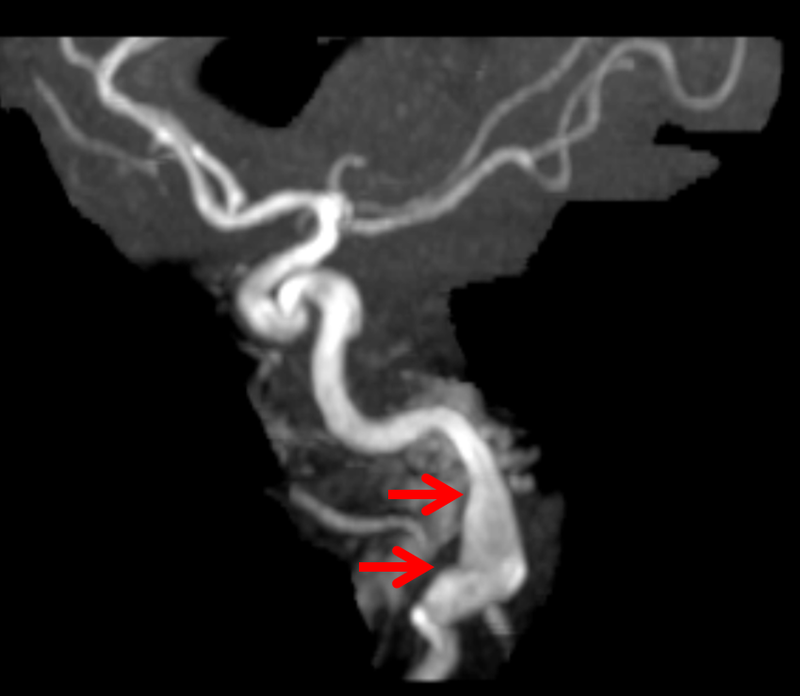 The dissection results in narrowing of the carotid artery with a small pseudo-aneurysm. As is typical, the dissection heals spontaneously over a few months. 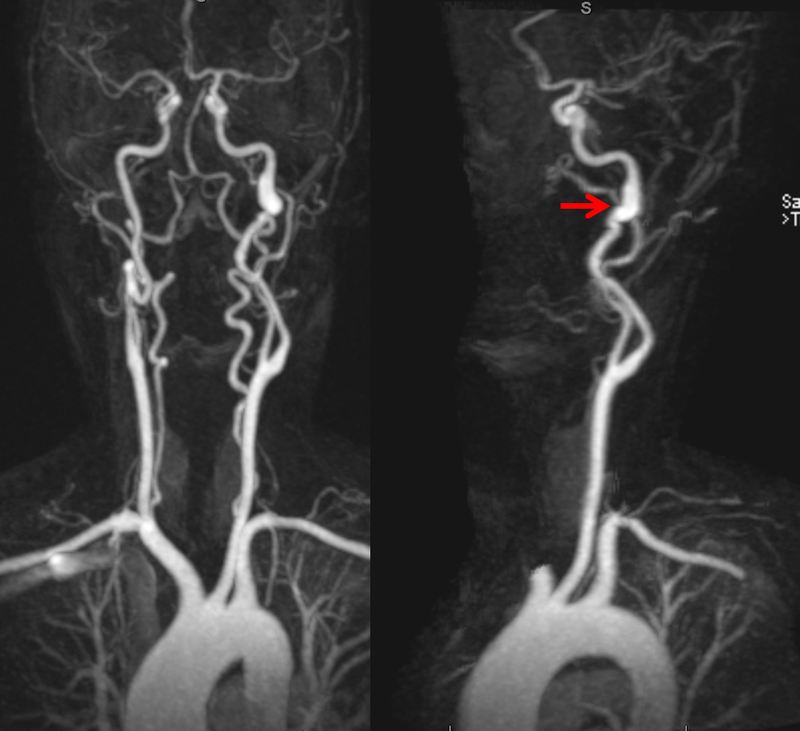 Unlike venous stenosis, dissection-related PT does not go away with gentle neck compression, which closes the jugular vein but does not affect the carotid artery. We DO NOT recommend trying to compress the carotid. It is harder to do it right, and carries a risk of additional dissection. Below is a different patient with left neck pain and left pulsatile tinnitus. This MRA was interpreted as normal. 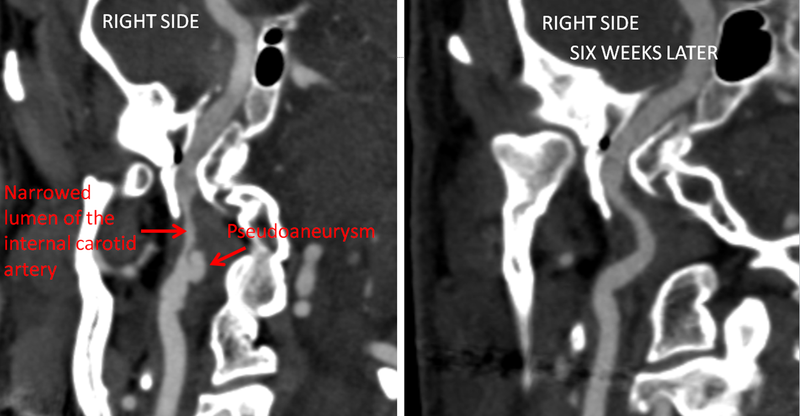 It is not — there is narrowing of carotid artery in the upper neck on both sides (arrows). Now, this is a very common place to see artifacts (fakeouts) on MRA. The above image alone is not enough to say that there is a definite problem. However, it is enough to make us look at source images. 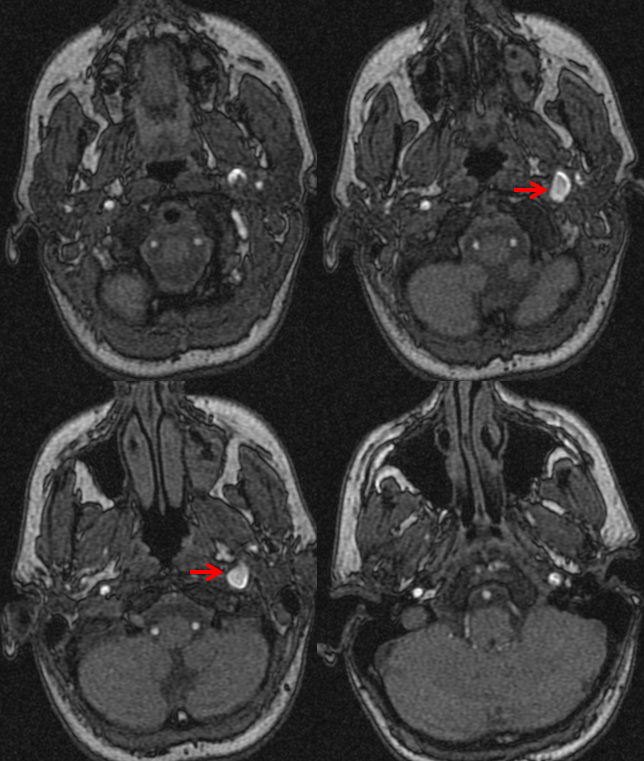 Both MRA source image (left) and T1-weighted MRI image are diagnostic of dissections on both sides. Left side is more acute and worse, hence the sound on left side only. The lumen is narrowed bilaterally (red arrows). 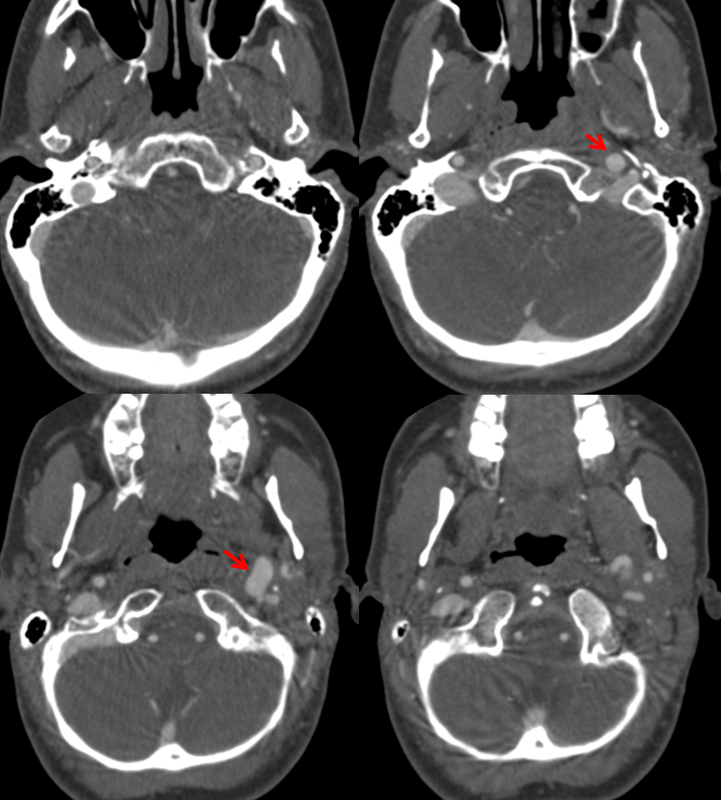 There is intramural hematoma present on both sides as well (white arrows). The fresher hematoma on the left is more hyperintense whereas the remote one on the right is darker. Other sequences confirm this timing. 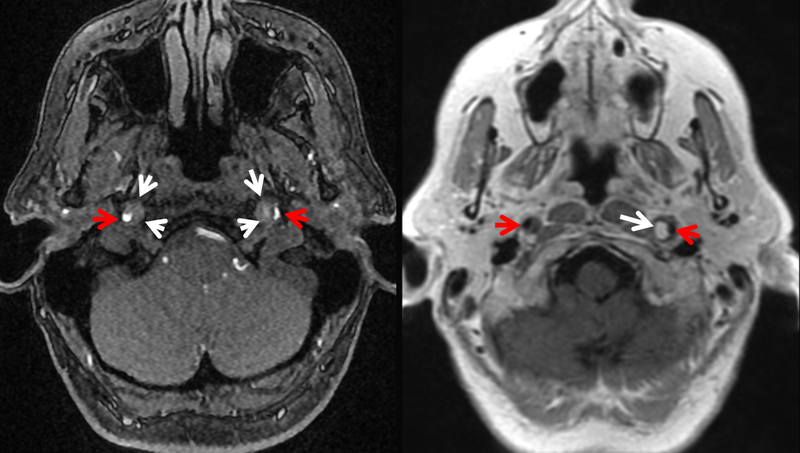 Incidentally, this patient also has mild venous sinus stenosis on the left as well (white arrows, stereo pair). The sound is not abolished by left jugular compression however, and history of acute neck pain onset concomitant with start of PT implicates dissection as cause. Treatment of dissection is usually medical — antiplatelets such as aspirin are first line. Occasionally, intervention with thrombectomy and/or stenting is required.